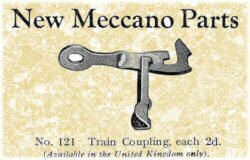 In 1920, Meccano introduced Hornby Trains, and at around the same time created part 121, the Train Coupling. In fact, the Meccano Train Coupling looks like it actually pre-dates Hornby Trains. Part 121 was shown under "New Meccano Parts" in the Meccano Magazine of March 1920, but Hornby Trains were not announced until the next issue that June. That first announcement shows the Train Coupling as a large hook with a single large wire loop (see right). 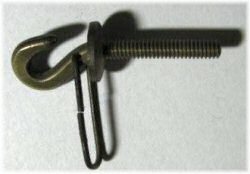 Fairly soon after this, and certainly before 1922, the part had three loops of chain as shown in the example at the top of this page, from a 1921 Inventor's Outfit B. Now, it is not at all certain that the single-loop version was ever produced by Meccano, given that the picture shown is very early. See the Architrave (part 108) for a similar example of early pictures not matching actual parts. At 6d each, these were not cheap parts. In 1925, the pressed steel 'type 2' Train Coupling was introduced at the much lower price of 2d, as shown in the article to the right from the December 1925 Meccano Magazine. 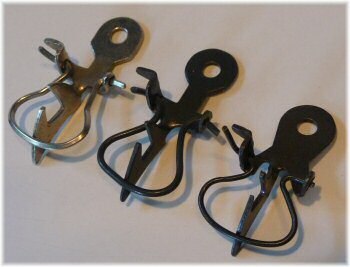 You can see that these were obviously much cheaper to make, being two fairly simple steel pressings hooked together. This later type 2 Train Coupling joins by hooking the loop of one coupling over the hook of the other one. You can see from the photo to the right that the holes in the Train Couplings are separated by approximately 2½" when they are joined. The two variants of the type 1 Coupling (single loop then three loop) are described above. There are also two versions of the type 2 Coupling, the second of which has a longer loop hanging from it. The precise date of this change isn't known. EMP gives the 'stamped' coupling as starting in 1925, and the longer one as coming presumably afterwards, but unknown. Does anyone have well-dated 30s outfits 7 or L with either the short or long Train Couplings? You can see from the picture that the longer loop Couplings also have a much more substantial hook stamping. 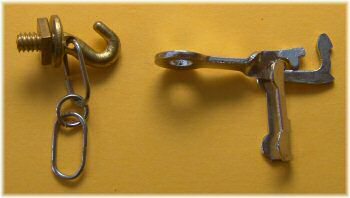 The two most obvious differences are the gap behind the hook (this is the same as the thinnest part of the hook in the larger part and the same as the thickest part of the hook in the smaller part), and the length of the drop link being approximately the same as the distance from the pivot of the drop link to the extreme inboard end of the coupling. Although the drop link in the picture at the top looks like a short one, I believe that this is the result of the photo being taken from an angle rather than from on top of the part. Hornby Train Coupling without hole – not a Meccano part! 1920-21 Brass couplings, "secured to the buffer beam by Meccano nuts". Apparently, only one end had the wire chain, the coupling on the other end having neither chain nor the hole for it (as per the example to the right). And "the very first issues... had a single brass loop". I believe that it is examples of this (Hornby Train) part that leads people to believe mistakenly that the first Meccano Train Couplings had only one loop. 1921-28 Large drop-link coupling. This is obviously the stamped coupling, but perhaps if this is the larger one (with the longer drop-link) then these should be first in the list. And starting in 1921? 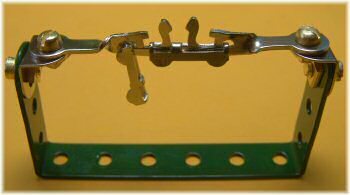 How soon did these make their way into the Meccano system? 1928-1958 Drop-link coupling. Although it's not very clear in the book, it appears that these may have been the shorter versions of the stamped type 2 coupling. It does say "They were smaller in all dimensions". There is a reference in the March 1928 Meccano Magazine of experiments being made to reduce the size of couplings, shown to the right. The only very well dated parts I have in intact outfits are from 1921 (which contain the three-link brass couplings) and from 1929 and 1930 (both with the smaller type 2 couplings). These fit within the date ranges above. We need more information on datable outfits to be sure about this. The trouble is, the only outfits to contain a pair of Train Couplings are the very last of the Inventor's Accessory Outfit B and the outfit 7 and L from 1926 to 1937. There were also a pair in the outfit 6 between 1926 and 1929. 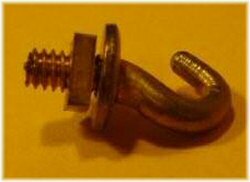 This would fit with the smaller drop link being far more common than the longer one, and the chain link brass coupling being rarer still. I tried to investigate spare parts prices to help me here, but it's rather confusing. The introduction above (in 1920) shows the parts at 6d, then the 1922 manual shows them at 4d. Are these the new Hornby-style stamped ones? But the price goes back up in 1924 to 6d, and by 1927 has dropped to 2d each (as per the entry in the 1925 Meccano Magazine shown above). These last are certainly the stamped out versions, and I'm going to stick my neck out and say that I believe the ones shown in that picture (New Meccano Parts at the top of this page) is of the larger drop-link version. So, my theory at the moment (very much subject to change!) is that the Meccano Train Coupling started life as the three-link-chain variety shown at the top, supplied only as a spare part and in the last of the Inventor's Accessory Outfit B. In 1921 the Hornby Trains started using the cheaper stamped-out part, but the stock of brass couplings was still sold (later only as a spare part) until the stock ran out. At some point (say 1924/25) the Meccano part became the larger stamped out part, which was included in outfits from 1926. In late 1927 or early 1928 the part changed to the smaller stamped part, continuing until around 1940 when it was dropped. I'm sure there are more Train Couplings around too, from similar dates. Anyone know of any others? Primus Engineering was a significant competitor to Meccano at around this time, and they had a very similar style of Train Coupling in their outfits. Primus Engineering Train Couplings are often mistaken for early Meccano ones. The Primus part is shown to the right, and is significantly larger than the early Meccano part, almost 2" long compared with less than an inch for the Meccano Train Coupling. To the left are shown the three different types of Automatic Train Coupling, shown as part number 121a in a French catalogue from 1938-39 and still there in the manuals for 1951-52. It disappeared from the French manuals in 1953, but was never available in the UK. The three versions are nickel and black, with slightly differently shaped stampings. I ask, and they turn up! As part of a recent job lot, Nick found this empty box of half a dozen train couplings. 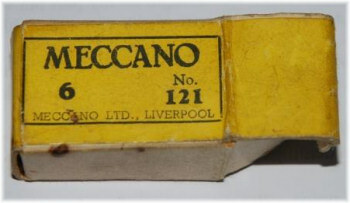 The font used for the part number and quantity matches other known parts boxes from the mid-1920s. ¹ I believe that the single loop version of this part was never supplied as a Meccano part, only part of a Hornby train. If you know bettter, please tell us! There are no train couplings in the French 1924-25 manuals. I have two train couplings (Type 2 with long loop) in a 1926 outfit N°6 with the original content. If I recall, Peter Matthews in ZA may have an original large single loop train coupling (i.e. not the Primus one). I'll ask him. At what mail adress I may send those documents ? Jean Claude, do you have a picture you can send in? duh?